Lyocell is a manmade fiber derived from cellulose, better known in the United States under the brand name Tencel. Though it is related to rayon, another cellulosic fabric, lyocell is created by a solvent spinning technique, and the cellulose undergoes no significant chemical change. It is an extremely strong fabric with industrial uses such as in automotive filters, ropes, abrasive materials, bandages and protective suiting material. It is primarily found in the garment industry, particularly in women's clothing. Fabrics derived from cellulose date back to the middle of the nineteenth century, though no one commercially produced one until 1889. A Swiss chemist, George Audemars, was granted an English patent in 1855 for an artificial silk he derived from mulberry bark. Audemars attempted to reproduce the method the silkworm uses for making silk by dissolving the fibrous inner bark of mulberry trees to separate out the cellulose. To form threads, he dipped needles into the cellulose solution and drew them out. Another chemist, Englishman Joseph W. Swan, modified Audemars' technique by forcing the cellulose solution through fine holes. His main interest was in producing filaments for electric lamps, but Swan realized that it was possible to manufacture a cellulose textile using his extrusion method. He exhibited cellulose fabric in London in 1885, but he failed to kindle any interest, and the project died out. Commercial production of a cellulosic fiber was first carried out by the French chemist Count Hilaire de Chardonnet. He exhibited his so-called artificial silk in Paris in 1889, and contrary to Swan's experience, people were thrilled by his new fabric. Chardonnet built a plant in Besancon, France in 1891, and had great success bringing his new fabric, now named rayon, to the forefront of the fashion industry. In the United States, rayon production began in 1910 under the auspices of the American Viscose Company. This company was an affiliate of Samuel Courtaulds and Co., Ltd., the forebear of the primary developer of lyocell, Courtaulds PLC of the United Kingdom (now known as Accordis Fibers). Chemists and manufacturers were intensely interested in manmade fibers in the twentieth century. Acetate, another cellulosic fiber, was first commercially produced in the United States in 1924. Chemists at the Du Pont company developed nylon in the 1930s, and it came into wide commercial use beginning in 1939. Acrylic and polyester were two other significant man-made fibers. These debuted in the 1950s. Nylon, acrylic and polyester differ from cellulosic fibers because they are derived from chemicals, and thus are totally manmade. Lyocell, rayon and acetate are based on the cellulose in wood pulp, and so these are often designated "natural" fibers, though the fibers would not occur except for a manmade process. A diagram depicting the manufacturing processes used to make lyocell fiber. producer Courtaulds Fibres and at an American firm American Enka, began investigating a new method of producing a cellulosic fiber through a solvent spinning technique. In this method, the cellulose is softened and then spun into fiber. Conventional rayon, by contrast, is called a "regenerated cellulose fiber," and it involves many more steps. The cellulose is first chemically converted into xanthate, then dissolved in caustic soda, then regenerated into cellulose as it is spun. The solvent spinning technique is both simpler and more environmentally sound, since it uses a non-toxic solvent chemical that is recycled in the manufacturing process. The solvent-spun cellulosic fiber lyocell was first produced commercially in the United States in 1992 by Courtaulds. The company used the brand name Tencel. The fabric was given the generic name lyocell in the United States in 1996. By this time, there was one other major lyocell producer in the world, the Austrian company Lenzing AG, which had acquired patents and research on lyocell from American Enka when it bought that company's rayon operation in 1992. The main ingredient of lyocell is cellulose, a natural polymer found in the cells of all plants. The cellulose for lyocell manufacturing is derived from the pulp of hardwood trees. During the manufacturing process, the hardwood is broken down into chips and then fed into a vat of chemical digesters, which soften them into a wet pulp. The pulp is washed, bleached, and dried in a huge sheet that is rolled onto a giant spool. with any dyes that are also compatible with cotton and rayon. 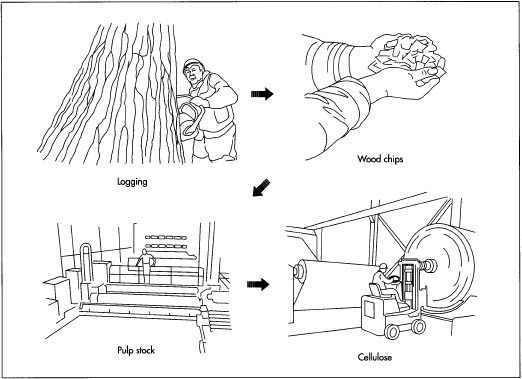 1 The hardwood trees grown for lyocell production are harvested by loggers and trucked to the mill. At the mill, the trees are cut to 20 ft (6.1m) lengths and debarked by high-pressure jets of water. Next, the logs are fed into a chipper, a machine that chops them into squares little bigger than postage stamps. Mill workers load the chips into a vat of chemical digesters that soften them into a wet pulp. This pulp is washed with water, and may be bleached. Then, it is dried in a huge sheet, and mill workers roll it onto spools. The sheet of cellulose has the consistency of thick posterboard paper. The roll of cellulose is enormous, weighing some 500 lb (227 kg). 2 At the lyocell mill, workers unroll several spools of cellulose and break them into one inch squares. The workers then load these squares into a heated, pressurized vessel filled with amine oxide. 3 After a short time soaking in the solvent, the cellulose dissolves into a clear solution. It is pumped out through a filter, to insure that all the chips are dissolved. 4 Next, the solution is pumped through spinnerets. These are devices used with a variety of manmade fibers. Something like a showerhead, the spinneret is pierced with small holes, and when the cellulose is forced through it, long strands of fiber come out. The fibers are then immersed in another solution of amine oxide, diluted this time. This sets the fiber strands. Then, they are washed with de-mineralized water. 5 The lyocell fiber next passes to a drying area, where the water is evaporated from it. The strands at this point pass to a finishing area, where a lubricant is applied. This may be a soap or silicone or other agent, depending on the future use of the fiber. This step is basically a detangler, making the future steps of carding and spinning into yarn easier. 6 The dried, finished fibers are at this stage in a form called tow. Tow is a large untwisted bundle of continuous length filaments. The bundles of tow are taken to a crimper, a machine which compresses the fiber, giving it texture and bulk. The crimped fiber is carded by mechanical carders, which perform an action like combing, to separate and order the strands. The carded strands are cut and baled for shipment to a fabric mill. The entire manufacturing process, from unrolling the raw cellulose to baling the fiber, takes only about two hours. After this, the lyocell may be processed in a wide assortment of ways. It may be spun with another fiber, such as cotton or wool. The yarn can be woven or knit like any other fabric, and given a variety of finishes, from soft and suede-like to silky. 7 The amine oxide used to dissolve the cellulose and set the fiber after spinning is recovered and re-used in the manufacturing process. The dilute solution is evaporated, removing the water, and the amine oxide is routed for re-use in the pressurized vessel in step 2. 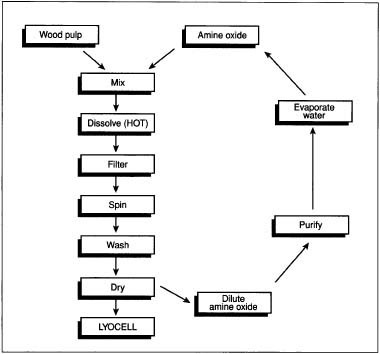 Ninety-nine percent of the amine oxide is recoverable in the typical lyocell manufacturing process. Lyocell is only produced at a few plants in the world. These are specially designed, state-of-the-art mills, and quality control is carried out by sophisticated computer monitoring systems. The computers continuously check a variety of key factors, such as the tenacity of the fiber, its color, the denier (a measurement of the fiber's diameter), elongation, moisture level, and level of the finish application. Computers also monitor for "trash" that results when one hole in the spinneret becomes blocked, and the filament comes out splintered or undrawn. The manufacture of lyocell produces no harmful byproducts and is significantly less toxic and wasteful than the manufacture of other cellulosic fibers. Its principal ingredient, cellulose, is easily obtained from managed tree farms, and the industry has not been accused of poor forestry habits. The amine oxide solvent is non-toxic, and because it is almost completely recycled during manufacturing, it is not released into the environment. Lyocell fabrics are also naturally biodegradeable. Manufacturing lyocell is also environmentally sound because less water and energy is used than in the manufacture of other manmade fibers. Kadolph, S.J. and Langford, A.L. Textiles. Upper Saddle River, NJ: Prentice-Hall, 1998. Maycumber, S. Gray. "Lenzing Developing New Lyocell." Daily News Record (October 14, 1993). McCurry, John W. "Lyocell Disciples See Lofty Future." Textile World (March 1998). Pfaff, Kimberly. "Courtaulds Tencel Plant Opens; Great Potential Seen for New Fiber Said to Feel Like Cotton, Wear Like Polyester." HFD (December 21, 1992).